My favorite class that I took in the program was definitely Parallell Programming. The knowledge I learned in that class about distributed systems still comes in handy and I use it every day as I now work on a team at Capital One that is building a platform on Apache Spark in AWS. When I completed the degree last month a friend at work asked me if I was going to go for another degree. The answer to that question is definitely not! At this point I have three degrees and that is about two (maybe three) too much. My original goal with getting the CS degree was to expose myself to a broader range of CS topics that I didn't have exposure to and I definitely accomplished that. Now though, I want to build real life products rather than academic assignments! 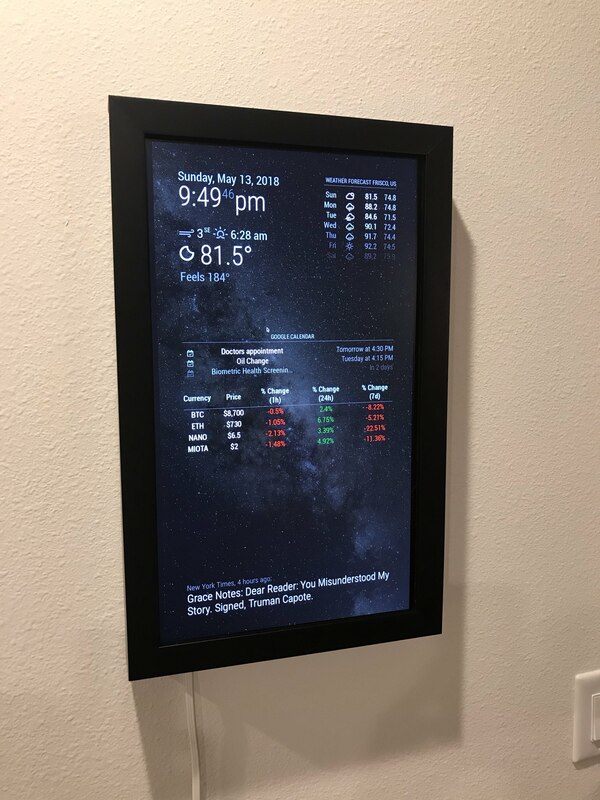 With that idea in mind, I worked with a good friend of mine, over the past month, to build a framed smart display that we are calling the InfoBoard! We put together all the components, configured the software, added a bit of custom code and then put it inside a custom frame. It’s powered by a Raspberry Pi and the Open-source MagicMirror Electron app. The screen can also be turned on and off by telling Alexa to do so. We started building it originally because I wanted to monitor cryptocurrency prices. It definitely works great for that by leveraging the MMM-cryptocurrency module that someone wrote for MagicMirror. The plan is to add a custom ui and more advanced features if we get enough interest. You can purchase the InfoBoard now on Etsy! For my next side project I plan to continue the theme of building things that solve my own technology problems. One problem I have is that I can't find a good To Do List/Planner app that does what I want it to do! So, I am going to build my own. I will post more about it once I get further along with that project. Another thing I worked on was moving this blog over to AWS S3. This blog is generated by the Pelican Static Site generator which is written in Python. Basically, the input is markdown files and some Python based rule files that get turned into the final static html/css/js output. Because there is no database or dynamic code executed on a server it's easy for this site to be hosted in what is essentially just a folder in S3. Prior to this I had this blog running on a Digital Ocean VPS. Going forward, this blog should cost me less than $.50 a month which is a lot better than the average $8 I was paying through Digital Ocean for a full VPS. You will also notice that this blog is now being delivered via HTTPS. HTTPS is the protcol that makes the web secure. It sets up encrypted traffic between two hosts and uses certificates to ensure that when you visit timothybramlett.com , you are visiting who you think you are. I highly recommend this type of setup for static sites. I am going to be doing a blog post over how to get it setup even if you don't have a lot of technical experience.